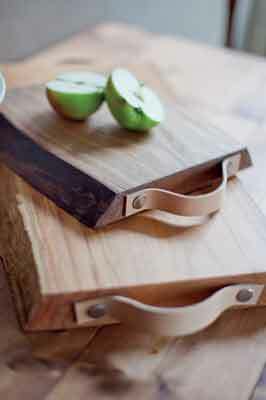 Everyone needs chopping boards in the kitchen and not just one, but probably several for different culinary purposes. The beauty of using waney-edge timber is that it doesn't need lots of preparation and finishing to achieve a really pleasing result. 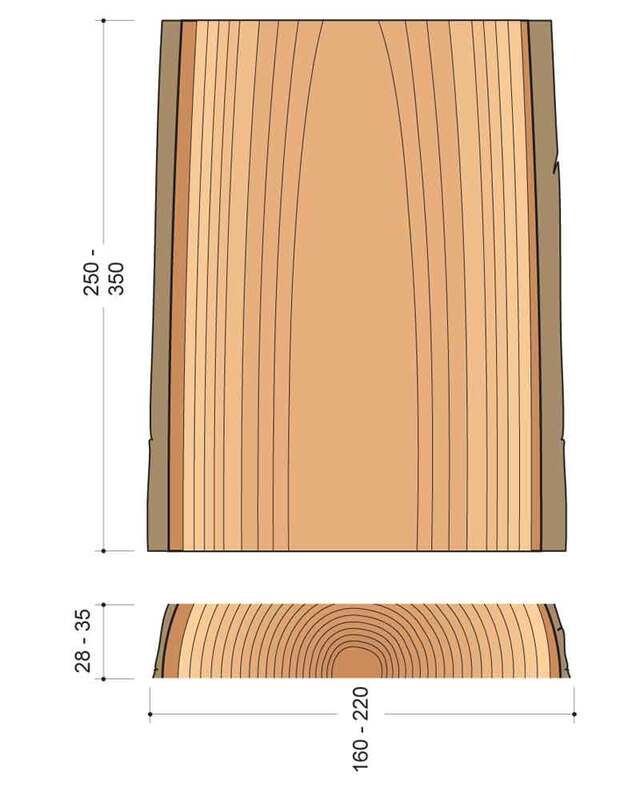 You need to choose a timber that is suitable for food preparation - any of the following are suitable: ash (Fraxinus excelsior), sweet chestnut (Castanea sativa), beech (Fagus sylvatica), sycamore (Acer pseudoplatanus) and cherry (Prunus spp.). Oak (Quercus robur) has a high tannin content, so not to be recommended. 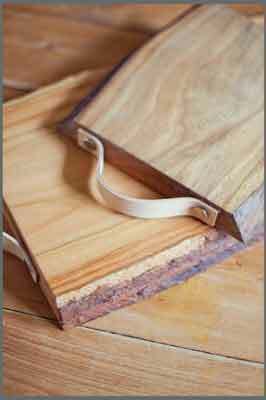 If you have a local woodyard, the chances are they will find you a few offcuts or a single larger board with which to make several chopping boards. 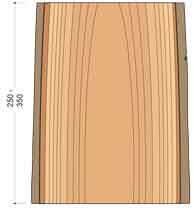 The key thing is that it must be waney-edge - that is with the bark still present - and cut towards the top or bottom of the log so it has curving edges rather than flat edges, which look much more pleasing to the eye. 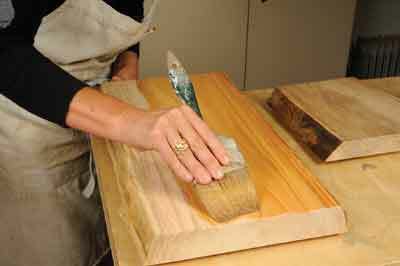 The first job is to cut the board to a suitable length: it can be short or longer, although this would need two grip handles instead of one. 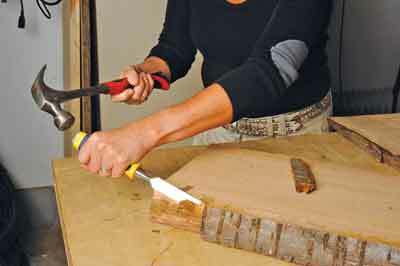 Take a sharp chisel and hammer or mallet and tap along, lifting the bark off. This needs to be a neat job, removing all traces of bark but without digging into the board itself. 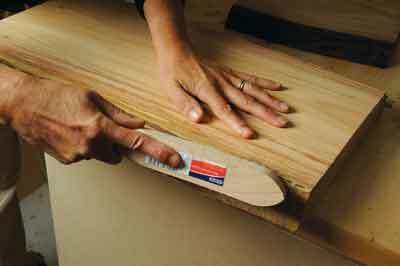 Once the bark has been stripped off, the board edges need a good wire brushing to remove any debris that may have been present under loose bark. The bare edges are likely to be somewhat uneven, which is fine, so long as there is no evidence of rot or insect attack. The board surfaces will be sawn and, depending on the type of saw used, may be smooth or rough in character. 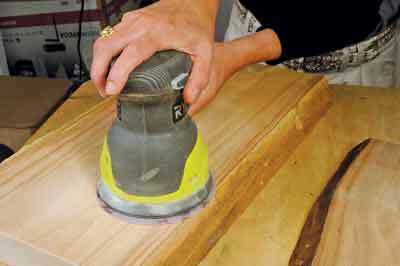 For a chopping board we need smooth surfaces, so being able to run the board through a thicknesser is preferable, but if one isn't available or if the board is too short to safely machine plane, you can use a jack with a blade sharpened to a slight camber - curve - which must only be very slight. You can then flat the surfaces working on the diagonal, so it slices the wood cleanly. After that, a good sanding is required. A suitable food-safe oil finish is needed. This should be applied liberally all over, wiped off and allowed to dry. 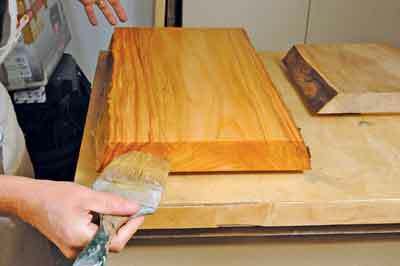 Re-coat several times until you get a pleasing sheen, lightly rubbing down with lubricating paper between coats. Don't forget to oil the ends properly as they tend to absorb more oil. Note the interestingly uneven edge texture of the board; this is where the bark has been plucked away. To complete the job, either one or two strips of hide leather need to be cut out with a Stanley knife. They can then be screwed to the board ends using non-rusting mirror screws run into predrilled pilot holes. Chrome cover caps can then be fitted. This is a very practical kitchen accessory that would make a great gift - you can even hang it up after use!